"Musical Moments are moments worth making!" 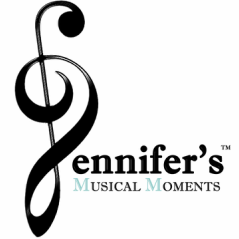 Jennifer's Musical Moments (JMM) was founded by me, Jennifer Lorys. I am a piano and theory instructor, accompanist, and music transcriber. I pride myself in offering individualized services. That means that the musical goals and aspirations of my students and clients are always my main focus, and I will work diligently with my students and clients to effectively create and achieve them. I believe that musical moments are moments worth making and I am definitely looking forward to making new ones with you!